You may often wonder what are New Fund Offers and what benefits they bring. This article attempts to break some myths about NFOs. NFO is the maiden subscription offer of a scheme to the public by a Mutual Fund (MF) . A new scheme (open-ended fund) is launched by an AMC once it is able to create a product different from the existing ones. For instance, in equity, a fund house with large cap, small & mid-cap funds, may launch a diversified scheme for investors to benefit across market capitalisation of stocks. Closed-ended funds, especially fixed maturity plans, are launched periodically by fund houses once the older scheme matures and is closed. NFOs provide an opportunity to invest in something new – either a new theme, new asset class, investment strategy or even new markets. The money collected by the fund house is invested across different instruments in line with the scheme's investment objective. NFOs are open for subscription for a limited number of days. Investors can buy and sell units of an open-ended scheme on an ongoing basis even after the NFO period is over. For closed-ended schemes, after the NFO period is over, a new investor cannot enter directly with Mutual funds. However, to provide a platform for investors to exit before the term, the fund houses list their closed-ended schemes on a stock exchange after the NFO period. In the first seven months of 2016, around 183 NFOs (open-ended and closed- ended) hit the market against 220 in January-July 2015 and 668 in January-July 2014, according to the Association of Mutual Funds in India (AMFI) data. Most investors believe that investing in a low-priced NFO (mostly Rs 10 per unit) is akin to investing in an equity share public offer (IPO) at a low price (better valuation) and, thus, a rush for investments. This is not true. An IPO allows investment in that company only. On the other hand, NFO's underlying investment would be a basket of securities invested as per the scheme's objective. The IPO literature (offer document) contains details about the company's operations, risks, financials and industry background. 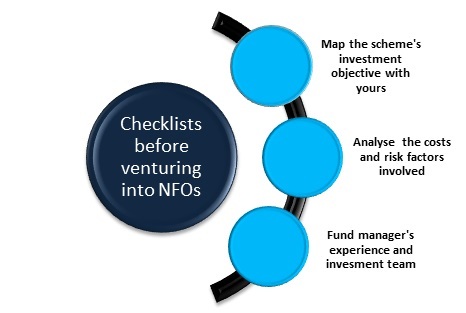 NFO's scheme information document highlights the scheme's investment objective, risk factors, asset allocation and details of the fund manager. NFOs should serve the investors' purpose and not just subscribe to it for the cheaper price. Invest in an NFO if the objective is in line with your goals and risk-bearing capacity. Evaluate the asset allocation pattern and costs involved (recurring expenses and exit load) from the scheme's scheme information document. Since new offers lack historical record, it is essential to gauge the fund manager's experience, qualifications and investment management team. Disclaimer :Any information contained in this article is only for informational purpose and does not constitute advice or offer to sell/purchase units of the schemes of SBI Mutual Fund. Information and content herein has been provided by CRISIL Research, a Division of CRISIL Limited, and is to be read from an investment awareness and education perspective only. The views / content expressed herein do not constitute the opinions of SBI Mutual Fund or recommendation of any course of action to be followed by the reader. Investors should consult their financial advisers before taking any investment decision.